In Europe, sword duel was once a common means to settle private disputes in a trial by combat. A one on one fight was considered more “gentlemanly” and honorable than simply arguing. Carrying swords in the public also was regarded as fashionable. 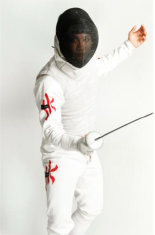 Although dueling was banned by law since the mid-19th century, the popularity of fencing continued as a sport. Modern Fencing basically evolved from the 16th century unarmored rapier combat. It comprises both tactics and strategies for the training of one’s skill and quick reflexes. Since the first Olympic Games in 1896, fencing has been a major sport event. In the last 60 years, two schools remain the dominant influence in the fencing world today: the French and Italian schools teach two distinct fencing styles. The French favor deft deceptions of the blade whereas the Italians favor stronger and more forceful blade actions.